Pamela has built a reputation as one of New England’s leading public strategists, based upon her expertise in public policy issues, public and community relations, and stakeholder communications, including all traditional and digital media. She has provided counsel to Fortune 500 companies, national real estate firms, entrepreneurial ventures, life sciences companies and organizations, healthcare and educational institutions and non-profit organizations. Pamela is a graduate of the University of Vermont. She is a Trustee Emeritus of the University of Vermont, and serves on the UVM Foundation Leadership Council and is a former Board Member. She was selected as a recipient of the 1996 UVM Alumni Achievement Award, and is also a former Chair of the UVM Fund at the University of Vermont. Most recently, Pamela received the 2013 Women of Finance, Investment and Real Estate from Banker and Tradesman, the real estate and finance publication of the Northeast. Pamela was named a recipient of the Greater Boston Chamber of Commerce’s Pinnacle Award in Entrepreneurship, awarded to women in Greater Boston who have achieved excellence in business and management, and was named in “BOSTON” Magazine as one of “The Top 100 Women in Boston”. 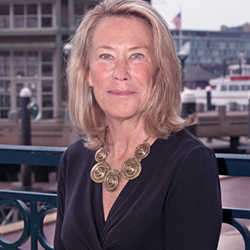 She also received the New England Council’s Leadership Award to Women in Business, and served two terms as President of New England Women in Real Estate (NEWIRE), a non-profit association of professional women in commercial real estate. She was appointed to serve as a Delegate to the White House Conference on Small Business. As part of her volunteer service, she served on the Board of Overseers of both the Massachusetts Eye & Ear Infirmary and the New England Conservatory. She also served in leadership positions on a variety of civic and institutional Boards, including the Big Sister Association, Boston Municipal Research Bureau, Massachusetts Taxpayers Foundation, and City-to-City, as well as chairing numerous charitable events over the past 30 years. She resides in Boston, MA with her husband, Terry, and has two daughters, Molly and Elle. Copyright © 2019 Breakthrough Advisors. Powered by WordPress. Theme: Spacious by ThemeGrill.